In PyLocator, markers are used to tag locations in 3d space. They are visualized using spheres and circles. The main use case is the localisation of EEG electrodes. These can be either surface electrodes or implanted ones. Basically, you have three options to insert a new marker. 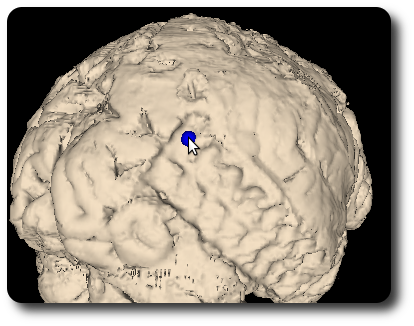 Especially when you are marking locations inside the brain, you’ll want to use the slice widgets for marking. Thats all. A blue circle will pop up, and in the 3d render windows above, a shpere will appear. Now the new marker will be inserted at the desired position. In certain situations your target might be easier to identify on a reconstructed iso-surface (see below), e.g., surface electrodes from simultaneous EEG/fMRI-experiments or subdural electrodes in brain extracted MRI recordings from epilepsy-patients. PyLocator tries to find the first point of the iso-surface that is below your mouse cursor and insert a marker here. If you have more than one is-surface rendered you must select on which surface you want to insert your marker in the settings of list of surfaces. 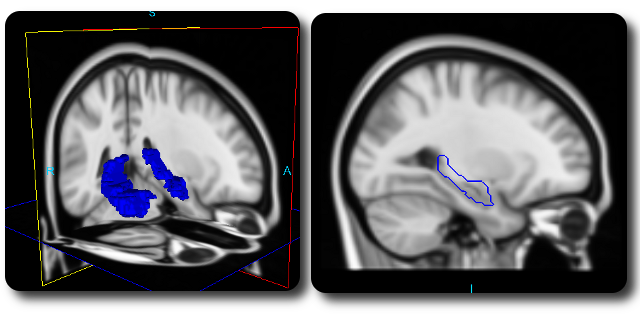 Looking at slices of tomgraphic scans is nice and helpful - slices is actually what tomography is all about. But this isn’t all one can do with such recordings, sometimes we just cannot grasp all the information contained. Calculating and rendering iso-surfaces can sometimes help here. is-surfaces are the 3d analogon of contour lines, connecting neighboring points of equal intensity. Rendering such surfaces with PyLocator is a one-click process: Just click the “Add” button on the toolbar of the surfaces list. PyLocator tries to estimate a good choice for a threshold of the surface, i.e., the value for which the iso surface is calculated. If the result is not as you expected (which is not really unlikely...), you can adjust the settings of the iso surface. Click on the list entry, and the options appear. Below these, there is an initially closed section to control the VTK pipeline. Here you can choose whether and how to use the Connect Filter and the Decimate Filter. Just play around a little bit to see how these settings influence the result. The Decimate Filter is disabled as default, but it might be useful to reduce the complexity of the surface in order to increase the performance on older computers. Navigating through a brain can be really complex, and one might quickly loose orientation. In such situations, it can really be helpful to have some “landmarks”. Here, regions-of-interest (ROIs) come into play. ROIs are shown in all visualization widgets: as iso surfaces in three 3d widgets and as contour lines in the slice widgets.